Cooking food simply allows for the mindfulness to flow while you create a harmonious feast for the senses. Steaming is incredibly mindful and frugal as well. You don't lose any of the nutrition or flavor that you lose if you boil them in water. This particular recipe even gets an A rating on my nutrition analysis. You simply cannot make a more mindful dish than this. Rinse the beans and snap off the ends. You can leave them long or break them in half as you prefer. Place the beans inside the steamer basket. Put about 2 inches of water in the pot - remember, the water should not rise above the steamer or the beans will sit in water. Nestle the basket of beans in the pot and set it on medium heat. When the water starts to steam, cover with the lid. Steam for about 5-7 minutes. Depending on how old or how large your beans are, it may take a couple more minutes. Don't fret the time, simply steam them until they can be easily pierced with a fork, or taste one and stop the steam when they are the way you like them. Carefully lift the steamer out of the pot and transfer them to a pretty bowl. Add the olive oil, lemon juice, garlic, almonds, black pepper, and salt if you are using it to the beans and toss gently. 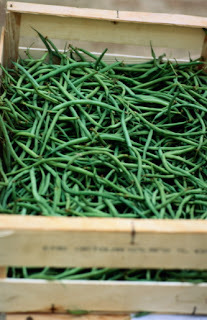 Enjoy this mindfully simple recipe in the spring when fresh green beans are filling the market place with inexpensive goodness. Enjoy. 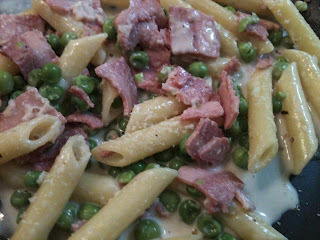 The following bit of deliciousness is my take on traditional Pasta with Ham, Peas, and Cream. If you are fortunate to be in Italy, you may find it listed as Alla Medici on many a great menu. Nigella gives you the proportions and preparation instructions so you can toss together that classic version of this dish to perfection here. I am not a classicist though and simply cannot leave a recipe alone. First, there must be garlic... I know, the overuse of garlic is such an American thing, but hey, I'm an American so garlic there will be! Second, there must be onions because well, everything must have onions...and more cheese because more cheese makes everything better. Third, I want the recipe to retain its quick to make on a weeknight awesomeness which means that I do not want to add any extra steps (like chopping, smooshing, and sauteing garlic and onions). Finally, I want to reduce the sodium and fat a bit (since I just ramped it up with the cheese), and so will replace the ham with low sodium organic turkey bacon and replace some of the cream with milk. So, with apologies to Nigella for mangling her recipe, I'd like to offer you my version of Creamy Pasta with Peas and Turkey Bacon. Please don't add salt. The cheese provides all the sodium needed. Taste it first before you salt, ok? First, measure and prep all your ingredients, set out a large pasta pot and a large colander. In fact, go ahead and set the table. It makes the cookery go so smoothly when you prep first and this is a very fast to make meal. I like to use the little acrylic custard bowls to hold things like seasonings but you use whatever you have. Bring a large pot of water to a rapid boil on your stove - you can salt the water or not as you prefer. Add the pasta, return to a boil, and cook per the package directions. About five minutes before the pasta is done dump in the peas and onion so they can merrily cook right along with the pasta. When the pasta is perfectly al dente, dump the entire thing into a colander and allow to drain while you make the sauce. Now, I warned you that there would be a time where your presence in the kitchen was mandatory. The next step is that time. You do not want the beautiful sauce to curdle or burn on you, so stay firmly planted near the stove from now on. Trust me, this is experience talking here. Return the pot to the stove top with the temperature set to not quite medium. Add the milk, cream, bacon, garlic and onion powders, and black pepper to the pot on the stove. Stir while it warms. Once the sauce is warm, add the Parmigiano Reggiano and stir until the cheese melts a bit - just a couple minutes will do. The cheese provides a thickening assist to the cream which would do a nice thickening on its own if it were not for the milk. Yes, for those of you not used to cooking with cream, it does in fact thicken as it simmers, if you use milk you may need more cheese. Milk though, curdles instead of thickening and burns so watch it like a hawk. Add the peas, onion, and pasta to the creamy mixture and stir for another minute or two while the entire thing heats to serving temperature on lovely plates of a contrasting color. Make sure the hand grater is on the table for those that think even more cheese is perfect. A nice leaf salad with a few sweet red pepper strips sitting on top is the most mindfully perfect accompaniment. This is one of the primal sauces. Master it and you will be able to cook so many things without having to open cans or packets. Put it in things, on things, next to things. Gussy it up, dress it down, it's one of the most versatile sauces around. Make sure you read the Variations for a few suggestions to get you going. Learning to cook a few basic sauces is beneficial on many levels - you are in control of the ingredients (this may be very important to you if your are on a fat or sodium restricted diet), it's often cheaper, it tastes a lot better, and the simple act of creating a sauce that has been made by not only You, but nearly every famous chef in existence is incredibly mindful. The next time you are tempted to buy a packet of white sauce mix and read the ingredients on the package. Bechamel is simply the French name for what many refer to as White Sauce. Then compare that list on the package to the recipe ingredients below and think about what you really want to eat. 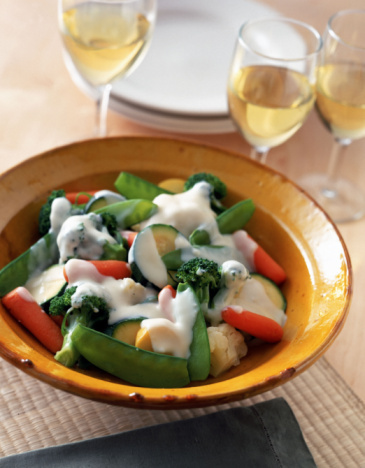 The recipe makes two cups, a fairly standard amount that can be used to scallop potatoes or drizzle over veggies. Add cheese and pour over cauliflower and you have the famous English delicacy Cauliflower Cheese. If you are interested in nutrition facts, here they are (set for those that use skim milk as I am assuming that if you click the word here, you are a calorie counter and looking for lower calories). A pinch of nutmeg or thyme is very good in this sauce. Melt the butter in a medium sized sauce pan over medium heat. Stir in the flour until it is thoroughly incorporated into the butter - about two minutes will help remove the "floury" taste and that's where many people mess up when making Bechamel. Remove from heat. Heat the milk in your preferred way - I've done it in a small pan or in the microwave. Either way is fine but get it hot. It should be heating while you are prepping the butter and flour. Dump the hot milk into the butter/flour mixture and vigorously stir or whisk to make sure the sauce is not lumpy. Return it to the medium heat and bring it to a boil - stir or whisk the entire time it is coming to a boil. Then lower the temp and simmer for another two minutes. Season with the salt, white pepper, and nutmeg to your taste. Add cheese after the final simmer if you are making something deliciously cheesy. Or make it even more savory - skip the nutmeg, add some black pepper or browned and drained breakfast sausage, it's great over a biscuit. Skip the salt and make sure you use skim milk to lower the fat and sodium. You may want to ramp up the pepper and definitely add the bit of thyme. Need to lower the calories even more or do not use milk? Make Veloute instead! My husband brought back a few bottles of Malbec after his recent business trip to Buenos Aires and I wanted to make a dinner to match the deeply colored highly flavored wine. What to serve with Argentinian wine? An Argentinian meal of grilled steak, Chimichurri sauce, Argentinian Black Beans (recipe link will be added here later), salad, and as an appetizer Grilled Provolone with Grilled Ciabatta Bread (recipe link to be added for this wonderful appetizer later). Chimichurri sauce is green because it is is packed so full of parsley! Mine may not be the authentic Chimichurri, but it's tasty! If you are interested in the nutrition and calories, you can find them here. I ran them assuming a fairly large serving. If you use less and are a calorie counter, take that into consideration. * many people like a more acidic Chimichurri. If you are one of them, please feel free to double the vinegar and lemon juice. A recipe is but a template, you take it and make it yours. Put everything in a large bowl (or blender) and finish the "chopping" with an immersion blender stick. I love the blender sticks because they are so much easier to clean than traditional blenders. Refrigerate for a couple hours, taste and adjust the seasonings - but remember, it will taste different when it is sitting prettily atop a forkful of steak. Serve the steak and Chimichurri with a hearty Malbec wine. If you cannot find a Malbec, then one of the more assertive Zinfandels will do in its place...I do NOT mean that pink wine that too many people think of when they hear the word Zinfandel. I mean a serious red Zin. A more feminine Pinot Noir or a subtle Cabernet would simply be lost on the palate under an avalanche of highly seasoned Chimichurri, making them most un-mindful choices. As you make and then eat this wonderful sauce, spend a few moments in the most mindful way you can. Appreciate the color, the silky texture, the aroma of the fresh ingredients while you chop, the aromatic mingling of aromas once it is mixed, and explore how the flavor changes when it is sampled alone and then when it is added to a bite of grilled beef. Enjoy. It's time to gather everyone from all across this beautiful Earth for a communal meal that is peaceful, wholesome, and delicious. Pull up a chair and join me in some good food, a nice chat... and may I pour you a glass of wine? Yes, it's red. I know, most people pair a white wine with a meal like this and if I had a Frascati chilling in the fridge, I might serve that. But this Ruvei Barbera d'Alba is so wonderful... and besides, the red kind is my favorite. What's a gnocchi and why would it be peaceful? Gnocchi is a little dumpling made of potato and semolina flour. They can be boiled or pan fried very quickly so they are perfect for a peaceful cookery conclusion to a wonderful day - even to a work day. I purchased pre-made gnocchi - sweet potato and whole wheat gnocchi! Lovely flavor, do try them. As this is a quick recipe to make, it's a good idea to get all your prep done first. Far less stressful that way. You also have the time to enjoy company while you cook so you don't get all frazzled once you realize you forgot the garlic. Frazzled people are not peaceful, so let’s cook up some peace. Parmesan to taste or omit the Parmesan and make it Vegan! Set your bottle of olive oil and gnocchi on the counter next to the stove. While you are at it, you may as well make sure there's some good fresh Romano or Parmesan in your cheese grater. I do hope you have one of those nice little hand held cheese graters for use at the table. There is nothing like freshly ground cheese to finish a dish nicely. Cut the stems off the broccoli close to the crowns. You can save these for another use or you may peel, slice, and use them in the dish. Separate the pretty little crowns of the broccoli so that you have them all nicely down to a manageable bite assuming the bite will also contain a gnocchi. Put the broccoli in a colander and gently rinse. Just let it hang there in the colander until its presence is required in the cookery directions below. Slice the garlic or run it through a press if you prefer. It all depends on how you enjoy your garlic. Allow it to sit exposed to air while you prepare the sun dried tomatoes... The World's Healthiest Foods says that the chemical reaction when the garlic juices are exposed to air enhances certain nutritional elements. I have no idea if it works, but my scientist family says it makes sense so I do it. Rough chop the sun dried tomatoes and place them in a small bowl. Measure the hot red pepper flakes and pour them on the tomatoes. If you want, you can put the garlic on top. It can finish it's magical chemical reaction right there. Put the seasoning bowl next to the gnocchi package. You might as well set the table now and open the wine to breathe. Put the broccoli in a 2 quart casserole with about a cup or so of water and nuke for 5 minutes if you have a new fangled fast microwave and 8 minutes if your microwave is 25 years old like mine and rather slowish. Let it sit covered while you start the gnocchi. If you are anti-microwave, no worries. Just boil or steam the broccoli for about 5-6 minutes and drain - make sure you reserve at least a cup of the boiling water. While the broccoli is cooking, pour about 2 T of olive oil in a skillet and heat the pan over medium until the oil just starts to shimmer. It's so pretty when it does that. Add the gnocchi and saute until they soften and brown. Let them sit a few minutes between stirs because that will help them to brown. They really don't take long to cook. They will soften and plump just a bit. While the gnocchi finishes browning, put the colander over a small bowl and drain the broccoli, saving the cooking water for later - in fact, just go ahead and put the cooking water by the stove so you don't forget about it. When the gnocchi are pretty and lightly browned, add the sun dried tomatoes, garlic, and hot pepper flakes. Saute for a couple minutes. Then add the broccoli and continue to stir. Add about 1/2 a cup of the water and keep a stirring. Keep this up until the dish is nice and hot throughout. Add water as you need to. Place in a serving bowl and enjoy with a twist of Parmesan and a drizzle of olive oil. This is not a "juicy" dish. Nor a complex one. If you would like it to be more moist, as if there were a sauce, add more cookery water from the broccoli and allow it to cook a bit more. It would probably be ok with some chopped fresh tomatoes which you could put in with the broccoli. To complete this meal, make a salad of mixed leaf lettuces with either sweet red pepper or tomatoes. If you want to make your very own gnocchi, let Benny the Chef show you how with his cookery book. You can over garlic this dish. I did. I used four large cloves of garlic and they overwhelmed the other subtle flavors. Two large cloves or 3 smaller ones will be fine. With this wonderful recipe, I Declare World Peace. Enjoy, mindfully... would you like another glass of wine? One of the most requested casseroles in our house is Enchilada Pie. I show you how I make it the way my family loves it, but there are many ways to vary this dish so it suits the way you eat. I'll list a few options so you can make it leaner and calorie friendly, or make just it spicy as all get out! If you watch your portions and don't get too free handed with the cheese, the calories are not at all bad! 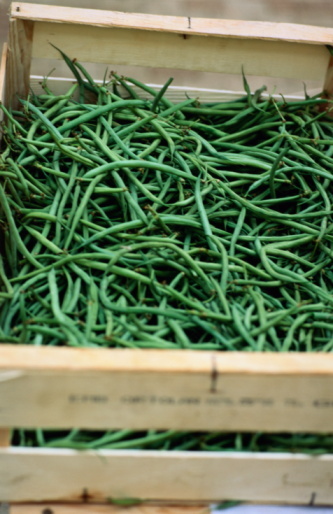 1 can Ranch Style Beans - do not drain as you will use the sauce. Now this does not make for the most healthy low sodium of dishes, so if you have to watch sodium, just use a can of drained and rinsed pinto beans and increase the salsa or add in some tomato sauce. 1/2 cup or so of salsa - use the kind you like, mild, medium, or hot. I love Paul Newman's Medium. The amount here is really just an educated guess on my part as I usually just dump it in the hot mixture from the jar and it is added in order to get a nice moist meat mixture. You could also just use a small can of tomato sauce if you really cannot take any spice at all. Optional: more jalapenos and chopped onions to layer into the dish. Put the beef and onion in a large skillet and brown over medium heat. Drain of all fat. Then add the beans, salsa, chili powder, cumin, and jalapenos. Simmer for 15 minutes and then taste. Adjust seasonings. Spray Pam on the bottom and side of a regular 2 Qt casserole dish. Lightly butter one side of each tortilla. Place 3 tortillas on the bottom of the casserole butter side up. Top with 1/3 of the meat mix. Sprinkle with a bit of cheese, add three more tortillas, another third of the meat bean mixture, and cheese. Add the last two tortillas, last bit of meat and beans and top with cheese. Cover and bake for about 40 minutes in a 350 oven or until a fork easily pierces the tortillas in the center and it is all bubbly and hot. The recipe does a pretty good job of filling that casserole dish. If you overfill the casserole or use too much cheese you may get some bubble over. If you are worried, put a piece of aluminum foil on the rack beneath the casserole dish. Or, just use a larger casserole so you don't have to worry about that. This recipe is easily doubled so you can use one of those great larger rectangular pans.